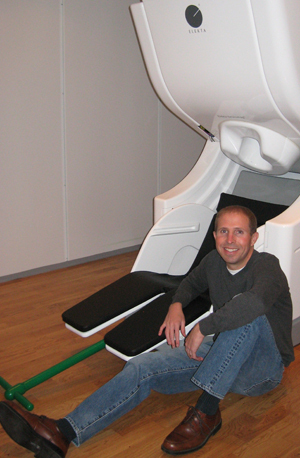 For almost 14 years Tony Wilson, Ph.D., has been working with MEG -- or magnetoencephalography. Since his doctoral training, using the first -- and at that time the only -- high-density MEG system in the world, Dr. Wilson has pioneered ways to use MEG-based imaging to evaluate severe psychiatric and neurological diseases -- HIV-associated cognitive disorders, post-traumatic stress disorder, attention-deficit/hyperactivity disorder and Parkinson's disease -- and to illuminate how pharmacotherapies modulate human brain function. On March 11, Dr. Wilson, assistant professor in pharmacology and experimental neuroscience, will receive UNMC's 2013 Joseph. P. Gilmore Distinguished New Investigator award. The ceremony will be in the Eppley Science Hall Amphitheater at 2:30 p.m., with a reception to follow in the lobby. MEG is a 100 percent silent, noninvasive imaging technique for mapping brain activity by recording magnetic fields produced by ultra-minute electrical currents that occur naturally in the brain. Dr. Wilson has used the method to pinpoint the regions of the brain affected by several neurologic and psychiatric disorders. He now measures the effectiveness of drugs or behavioral therapy on those areas. "Our basic goal is to study human brain networks in the context of brain disorders," he said. "We want to eventually connect abnormal activity in specific brain networks with individual neurologic and psychiatric disorders. The symptoms associated with these conditions reflect the involved brain networks, but we are only beginning to understand the precise mapping between expressed symptoms and specific networks." Dr. Wilson is at various stages of several ongoing studies, but still looks for ways to expand the use of MEG imaging in this golden age of brain research. "Finding brain markers, or signatures of a specific disease, is important for advancing treatment and neuroimaging is critical to this effort," he said. Dr. Wilson joined UNMC in November of 2008 as the scientific director of the new Center for Magnetoencephalography. UNMC was one of the first medical centers in the United States to get a state-of-the-art 306-sensor MEG system, which remains the most advanced system currently available. "We map regions of the brain that become active when a person performs memory or language tasks, executes simple hand movements, or utilizes one of many other cognitive functions," Dr. Wilson said. His long-term goal is to develop predictive markers for diagnostic and prognostic applications, as well as monitoring disease progression and testing new candidate treatments for neurologic and psychiatric disorders. Congratulations! This is exciting work. Kudos, Tony! Very happy for you! The Joseph P. Gilmore Distinguished New Investigator award is named for Joseph Gilmore, Ph.D., who served as professor and chairman of the UNMC Department of Physiology and Biophysics from 1970 to 1987. He died in 2007 at age 78. Dr. Gilmore elevated the level of cardiovascular and renal research at UNMC to world-class levels, and obtained the first NIH training grant at UNMC. The winner of this year’s Gilmore award, Tony Wilson, Ph.D., never met him, but he was impressed by Dr. Gilmore’s scientific accomplishments and that he was awarded UNMC’s first NIH training grant. Howard Gendelman, M.D., chair of pharmacology and experimental neuroscience, said Dr. Wilson is a scientist's scientist. “He brings scientific intuition and resourcefulness to discovery. He is after all a masterful teacher, but the best teaching Tony does is by example. He is one of the few scientists who can skillfully sift through the myriad of conflicting results in any pursuit to seek answers to complex questions,” Dr. Gendelman said.